The pic 'sweeping the tunnel roof of Casey Base' was a 'one off' job. We had received a very heavy snow storm a few days before the pic was taken. One of our Radio Techs, (whose name just escapes me at the moment - but he comes from Melbourne), decided to get out the broom one very sunny morning and do a clean-up of the roof. It made for very good photography. The tunnel roof was only cleaned that one time & from memory, it was not long before the RTA ship arrival, so the clean-up was mainly to fill in a little time. The tunnel was not heated at all. The wind at Casey base blew only from one direction all the time. (East to West). The Base of course was raised up on 'stilts' as we did have some very high snow drifts around the Base. With the tunnel being built on stilts, we did not have a build up of snow which can be a problem burying all sorts of things. The strong blizzards which we often received at Casey simply blew under the tunnel and living/working quarters carrying the snow with it, hence, it did not build up near the living/working environment - which was a real plus for us. The tunnel & the associated living/work places was about 3/4 kilometre long & could be accessed at either end and in the middle by stairs. During a blizzard, blowing snow often made it into the tunnel through the pin holes that were in the galvanized "1/2 water tank" sized tunnel. The tunnel was a real 'Godsend', we could enter our living/working quarters without having to get into heavy & warm clothing, in fact, we could spend the entire year in the tunnel without getting out of it, in fact, you could become a 'Cave Dweller' (a trogladite). Casey Tunnel. Photo by Peter Strickland. The incident happened during V5 of the 1980/81 season, the first marine science voyage (FIBEX) of the newly refitted Nella Dan. The vessel left Melbourne on 9 January, first visiting Davis and then Mawson (3-10 February). The LARC V (Lighter, Amphibious Resupply, Cargo, 5 ton) was the standard ship-shore transport at the time, although in ANARE service the payload was less than 5 ton. At Mawson, this particular LARC was taking cargo from the forward, starboard side of the ship. The cargo was long bundles of piping that were laid from the stern of the cargo well onto the strong-back behind the operator’s cabin. Unfortunately the cargo slid on the strong back to the outboard side, the vessel listed severely, the engine plates dislodged, and the bilge filled with water. She briefly hung sideways beside the ship on the spring lines before they snapped and she sank to 30 m depth in Mawson Harbour. Both “Larcies” had got clear into the water and were quickly recovered onto the ship. Fortunately there was diving gear and 2 experienced recovery divers onboard, Paul Butler (incoming 1982 Mawson OiC) and Rick Burbury (Marine Science support), so a recovery exercise was launched pretty much immediately. The photo shows the bow of the recovered LARC, lifted by the ship’s derricks, just breaking the surface. From there lines were attached to the stern and the LARC was swung into a horizontal position, just underwater. The second LARC then came alongside and used a fire pump to empty her till she floated. She was towed ashore to Mawson, well after midnight, and the bilge was filled with fuel oil to prevent corrosion. Over the next few weeks, while Nella undertook the marine science program, larcies and diesos worked to repair the craft. By the time Nella returned to Mawson (early March) she was running again, although without the engine plates she was not seaworthy. The pipes (along with heaps of other stuff from other incidents) remain on the bottom of Mawson Harbour. 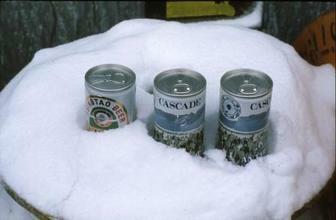 The Cascade beer was a promotional stunt from the Cascade Brewery whilst I was doing my training in Melbourne for the 1980 Mawson trip. They gave us heaps of the stuff with the Penguin cans, it went down very very well indeed.